Next Thursday sees our final screening of the year at Gallery Munro House. Showing alongside the 26th Shot Up North SUN Awards, we bring you Finding Vivian Maier (2013). This revelatory documentary follows the mysterious nanny Vivian Maier (1926-2009), who secretly took thousands, if not hundreds of thousands of photographs over her lifetime and hoarded them away in storage lockers in Chicago. Only in 2007 were they discovered. These photos, deemed some of the most important pieces of Street Art Photography of the last century, are currently being archived and catalogued for the pleasure of the public and future generations. With roughly 90% of her work now archived, they have become a critical part of Street Photography history. As Director John Maloof’s first production alongside Charlie Siskel (Review, Tosh.0), this multi award-winning documentary is the recipient of the 2014 Miami Film Festival Grand Jury Prize. 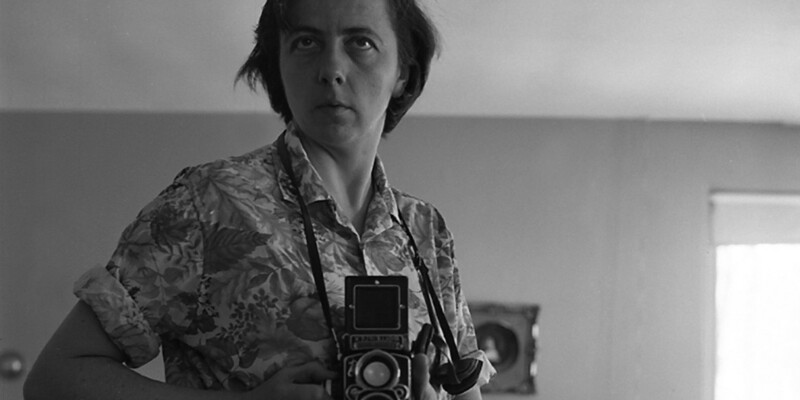 Vivian Maier has been described as “unique” and “closed” by her friends and family as well as those who employed her. This ground-breaking documentary seeks to get to the bottom of exactly who she was, why she was so interested in photography and how exactly she managed to take so many photographs and films without the knowledge of those around her. This private passion of hers was kept behind closed doors, even explicitly stating to her employer and the children in her care to never enter her room. Vivian kept herself and her photographs carefully guarded and locked away from prying eyes. However, this film does not only explore her secret passion, but also her secret identity. Not only did this mysterious woman use several names, but she also had a special connection with people that was showcased through her photos. As explained by a friend in the film, “people accommodate her”, suggesting an ability for Vivian to get close to people she barely new. The element of mystery in this documentary is what makes it so intriguing, but also what leaves the audience wanting to see more. Finding Vivian Maier – as told by her friends, employers and the children she looked after – not only captures the audience’s heart but their imagination and curiosity as well. The screening takes place Thursday 4 December in Gallery Munro House at 7PM. Doors open from 630PM and tickets are available from Café 164 and our online ticket office.